Tip: Get tired of SMPlayer? Why not try 5KPlayer, free alternative player for Windows. 100% clean. Play 4K/HD/SD, MKV, AVI, VOB, DVD videos and more free! 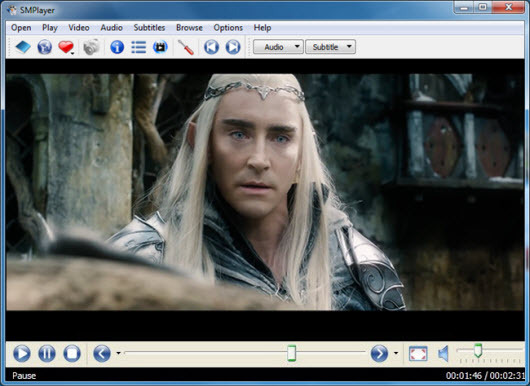 Want to download SMPlayer 64 bit, the free DVD/HD/SD video player for MKV, AVI, VOB, MPEG videos and DVDs on Windows 10 or Windows 7? Please read below. On the video-player spectrum, SMPlayer is somewhere between the full-bodied Miro and the super-lightweight VLC Player. This freeware player, intended to be a front-end for MPlayer, from basic features like playing SD/HD videos, DVDs, and VCDs to more advanced features like support for MPlayer filters and more. Meanwhile, lots of SMPlayer users are expecting it could upgrade as free Blu-ray Player Software. One of the most interesting features of SMPlayer: the SD video player remembers the settings of all files you play. So you start to watch a movie but you have to leave, don't worry, when you open that movie again it will resume at the same point you left it, and with the same settings: audio track, subtitles, volume. SMPlayer's subtitles are fully customizable, including color, font, and size, and it can stream in content from the Internet. SMPlayer also works on both Windows and Linux, and it's supported in more than 30 languages. There's also a karaoke filter, so you can remove the audio track. 1. Configurable subtitles. You can choose font and size, and even colors for the subtitles. 2. Audio track switching. You can choose the audio track you want to listen. Works with avi and mkv. And of course with DVDs. 3. Video equalizer, allows you to adjust the brightness, contrast, hue, saturation and gamma of the video image. 4. Filters. Several filters are available: deinterlace, postprocessing, denoise. and even a karaoke filter (voice removal). After SMPlayer download on Windows or Linux, as you might expect, the install file is quite large at over 20 MB, and it takes up a fair bit of RAM. We experienced no stability issues with the program, so we're quite comfortable in recommending it as a strong secondary player or even a primary, if one of its more esoteric features is just what you need. SMPlayer Pros: An excellent video player with most of the best features we require to view quality videos and movies.The hot-key controlled contrast, brightness and gamma adjustments of video are fine. A stable and dependable video player(for win-xp-sp3) with many features that we can't get in others. One of the rare features is that if you quit the player in the middle of playing a video and close the pc and after sometime when you restart the player, it will start from where you stopped. SMPlayer Cons: Could not find subtitiles if set to "same name as video file". Still no presets for audio equalizer. Does not support standalone VOB files & interactive SWF files. Could not associate RM files properly in Win Vista & 7. Does not support Blu-ray. Not stable with 1080p HD Video. SMPlayer used to be great and is still a competitive viral of VLC (SMPlayer vs VLC), but it kinda lagging behind. Yes, no player is perfect. But some fresh force comes with challenging power. 5KPlayer is among one of them with ultramodern features like AirPlay receiving and sending, online video downloading and so on. It is a totally free video player for both Windows (XP and Windows 10 included) and Mac OS (macOS Sierra included). 5KPlayer is the ultimate DVD/4K UHD/HD/SD video player that, when playing 1080p AVCHD, TS, MKV, MPEG4, H264 videos/movies, will bring razor-sharp HD images as well as high-definition audio enjoyment. Efficient launching and running process cause lowest use of your computer's horsepower, so 5KPlayer can be regarded as most low-carbon Free Media Player program ever for both Windows and Mac. 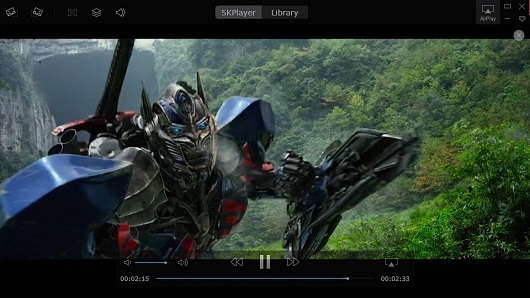 In addition to act as a media player, 5KPlayer can also help get online HD/SD videos songs downloaded, and free stream videos/movies/music from iPad, iPhone to PC/Mac, or from PC/Mac to Apple TV, AirPlay-enabled speakers, etc. : SMPlayer - SMPlayer intends to be a complete front-end for MPlayer, from basic features like playing videos, DVDs, and VCDs to more advanced features like support for MPlayer filters and more. : 5KPlayer - 5KPlayer is powerful, simple to use and all-in-one video/audio player software for windows and Mac that plays all audio/video multimedias easily and smoothly.